In today’s society, more and more families are realizing the importance of exercise and physical fitness. We all know the value of being active, as sedentary lifestyles often come with a myriad of negative consequences. As a parent, you’ve likely looked for a children’s playground near you that can provide your little one with freedom and excitement. One debate that arises across this nation is whether your child would benefit more from outdoor or indoor playtime. While playing outside in Mother Nature provides a wide range of benefits, our kids indoor playground in the Bellevue area is designed to take playtime to a whole new level. Your little one can run, jump, and play in our exciting facility, featuring engaging activities and exciting structures to let his or her imagination run wild. Funtastic Playtorium is dedicated to safe, fun-filled activities for little ones aged 10 and under. While outdoor playgrounds are designed for fun, we believe that our indoor facilities hold the edge. Today, we’ll highlight a few more advantages of our indoor playground for kids. If you’re looking for a fun place to let your little one run around, or if you need a kid’s birthday party venue, be sure to contact us today! While outdoor play places are great, they often do little to enhance a child’s imagination. Our indoor playgrounds in Factoria and Alderwood are designed to maximize your child’s creative time by introducing fun and colorful elements that are only limited by your child’s imagination. Outside playgrounds feature structures that, while fun, rarely change over the years. Additionally, exterior concerns such as the weather and property theft minimize your playground’s ability to provide a full level of play for children. Funtastic Playtorium focuses on creating exciting areas for little ones to run amok through, engaging young minds and encouraging them to think outside the box. Hosting an event such as a birthday party at your park can seem simple and affordable, yet the risk remains of weather problems or a lack of space. Your kid-friendly event may be spoiled from rowdy kids wishing to join in or insensitive adults hoping to have their own good time. Our indoor playground is safe and secured, keeping unwanted guests away while allowing your friends and loved ones to have fun at their own pace. We also offer birthday party reservations, so be sure to contact us today if your little star is about to become a year older! Outdoor or Indoor Playgrounds: Which is Best? 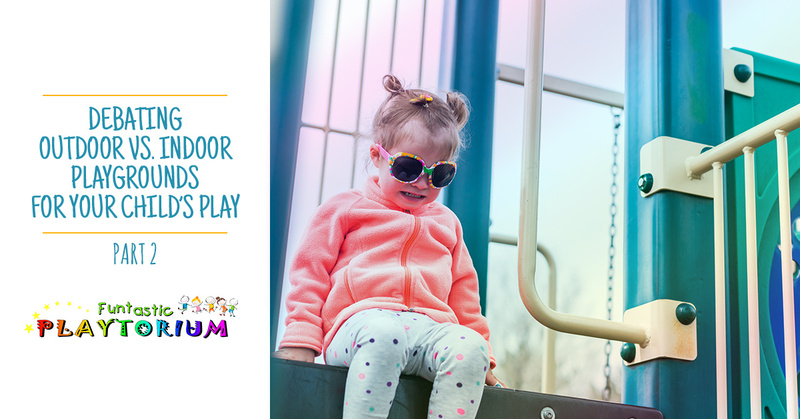 We love the fun and safety that our inside playtorium provides for children, yet we understand the allure of playing outside in the fresh air. Now the question remains — which is better? Both! Each setting provides its own unique benefits and drawbacks, yet the most important factor in this debate is the ability to let your little one run free and connect with their inner craziness for a while. Outdoor spaces are ideal for receiving sunshine and nature, yet indoor structures allow for more freedom of play and additional safety. You can benefit from both places, but if you are looking for an indoor playground in the Bellevue area for your child to run, frolic, and galavant freely, Funtastic Playtorium is here to help. Contact us today to learn more about our Factoria or Alderwood playgrounds for kids or to reserve your upcoming birthday party!